The Federal Reserve halved the number of rate hikes it anticipates this year from four to two. The market has been moving toward this as well after having thought the would be no hikes this year. The dollar sold off. The dollar-bloc currencies and emerging market currencies are have rallied sharply. 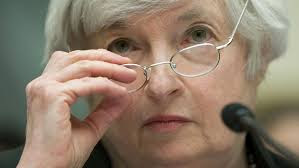 Risk assets in general like the idea of a less hawkish Federal Reserve. The Fed's dot plots point to a Fed somewhat less confident on the near-term outlook but maintained the expectations of four hikes next year and in 2018. The long-term equilibrium Fed funds rate was cut to 3.25% from 3.5%. The Fed maintained when it expects inflation to reach the two percent target, but changed the path by cutting this year's forecast to 1.2% from 1.6%. There was one dissent. George from Kansas wanted to hike rates. There were no dissents in December when the Fed hiked rates. The FOMC statement was little changed. The changes in the statement are mostly in the first paragraph where it offers its economic assessment. It notes that despite the global economic and financial developments, Us economic activity has been expanding at a moderate pace. It sees labor market improvement and household spending increasing "at a moderate pace." It notes that business investment and next exports remain soft. It upgrades its assessment of market-based measures of inflation expectations remain low (changed from declined further). Fed funds futures have rallied. The market has reduced the chances of a June hike. If the Fed were to hike rates in June, fair value would be about 50 bp. The market was nearly there earlier today, but now is back to 44.5 bp, which is where it was on March 3-4, before the employment data. The euro held support we identified near the breakout from the ECB meeting in the $1.1040-60 area. It has now moved to almost $1.1190. We have suggested that provided the breakout holds, the euro can move back toward $1.1300. Although stocks have rallied, so have US Treasuries, and this seems to have knocked the dollar against the yen from around JPY113.80 to JPY112.80, just above yesterday's low (~JPY112.60). Sterling has recovered from the budget-induced slide to almost $1.4050 and is now nearing $1.4250. With Saudi Arabia and Kuwait suggesting they could agree to a production freeze regardless of Iran's decision as early as next month, and the less hawkish Fed has sent the Canadian dollar sharply higher. The greenback has returned below CAD1.3200 and is nearing the CAD1.3170 area seen before the weekend.